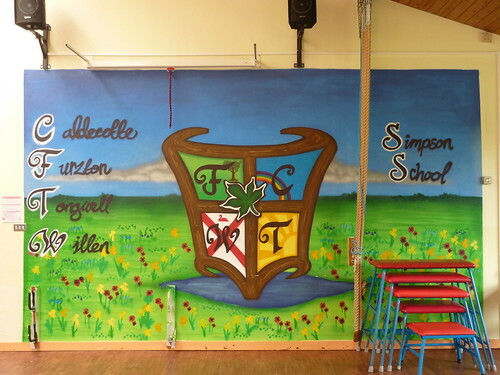 Simpson School children produced designs for the school hall wall based around the idea of a coat of arms featuring various elements from each house and year group.The winning designs were combined to create the fabulous finished article with the children producing flower stencils which represent each house and adding them to the finished piece. An art work was also created for the bike shed with the students adding leaves using a stencil technique. 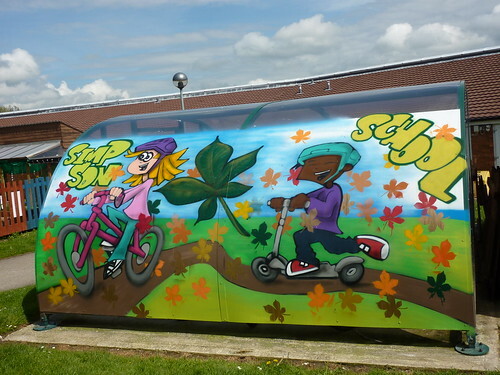 This entry was posted in Artwork, Workshops and tagged art workshops with young children, bike shed mural, school hall mural, simpson school art, simpson school graffiti, simpson school milton keynes. Bookmark the permalink.